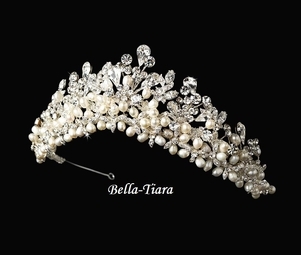 Royal Collection - Cleopatra -- Amazing Freshwater Pearls Crystal Tiara - SALE!! 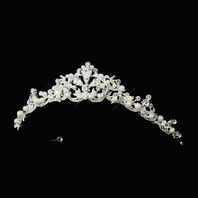 HOME / WEDDING HEADPIECES / Wedding Tiara / Royal Collection - Cleopatra -- Amazing Freshwater Pearls Crystal Tiara - SALE!! 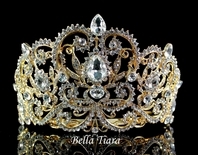 Description: Gorgeous Tiara. GET NOTICED!!! 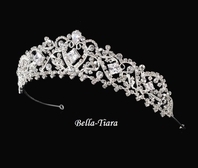 Add glamour with a touch of traditional to your perfect dress. 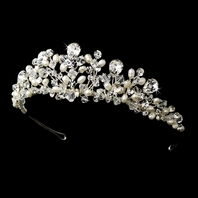 Feauturing Stunning creamy Freshwater Pearls and sparkling rhinestone floral vine display. Measures approximately 2" tall on a silver band with a loop on each end.